Once September rolls around I become obsessed with pumpkins. I’m not quite sure why I love pumpkin so much – I didn’t grow up eating it and to this day mom tells me that she’d rather die than eat pumpkin pie. It’s not that she hates the fruit (yes, pumpkin is a fruit! ), it has to do more with the spices, specifically cinnamon. I am totally the opposite — I think pumpkin pie spices, especially cinnamon, are the best thing about pumpkinfied foods. Fall is my all time favourite season and even though we’re in Southern California right now and it’s not even remotely Fall-like, I’m still getting my pumpkin on. 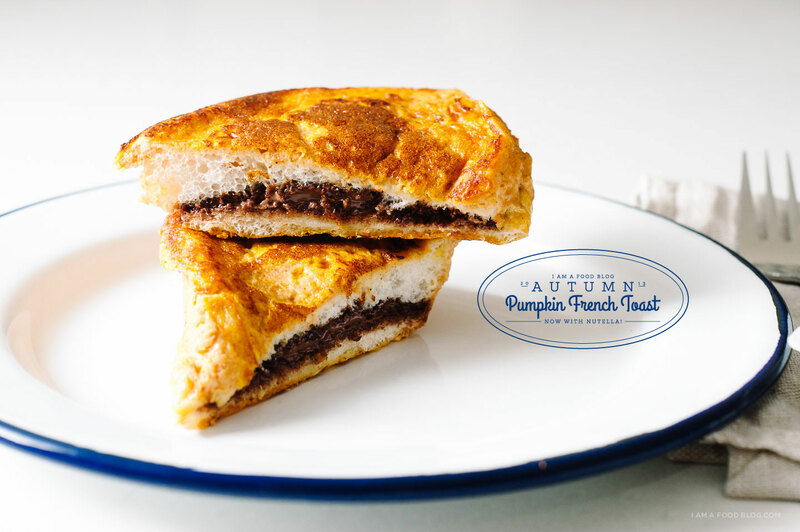 This pumpkin French toast is doubly delicious due to the pumpkin and Nutella. 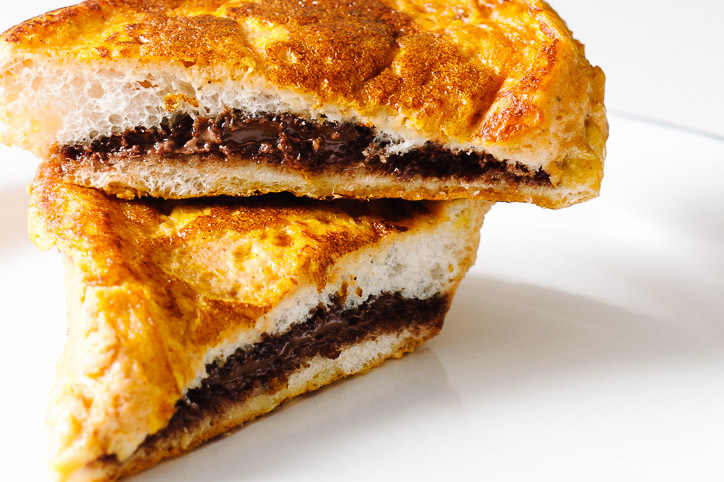 I love how the Nutella gets all gooey and melty. 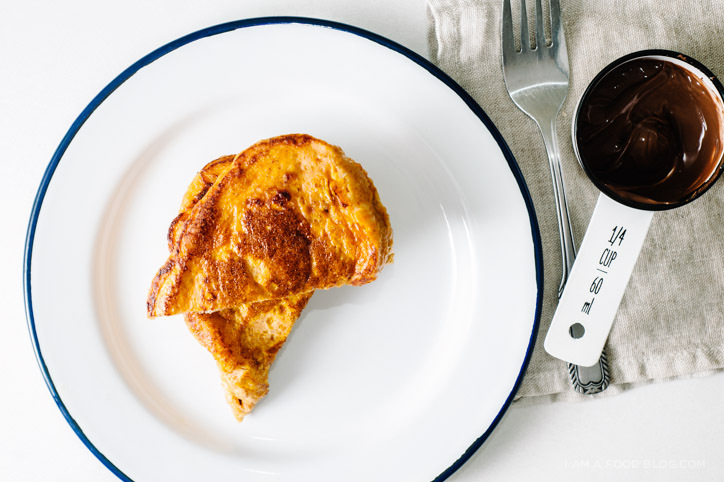 The pumpkin flavour in this is on the lighter side — even Mike enjoyed this French toast and he doesn’t usually like pumpkin. Give it a go even if you aren’t a pumpkin fan, maybe it’ll become one of your new fall favourites. Beat eggs, milk, pumpkin, and spices together in a shallow bowl. 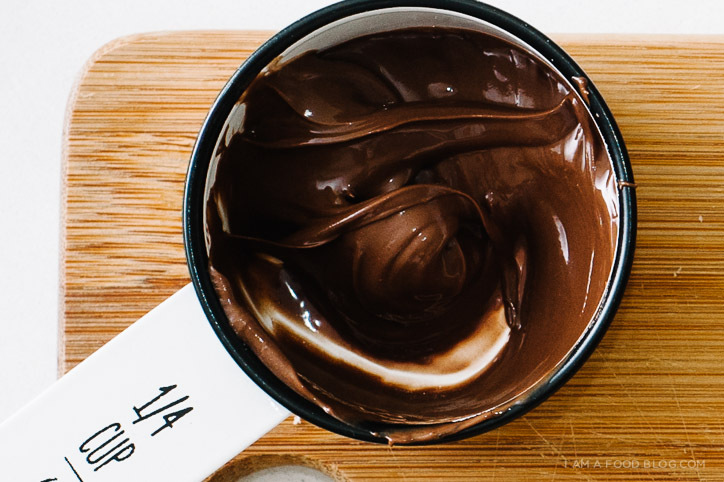 Make four Nutella sandwiches. Dip sandwiches into the egg mix allowing the bread to soak up the eggy goodness. 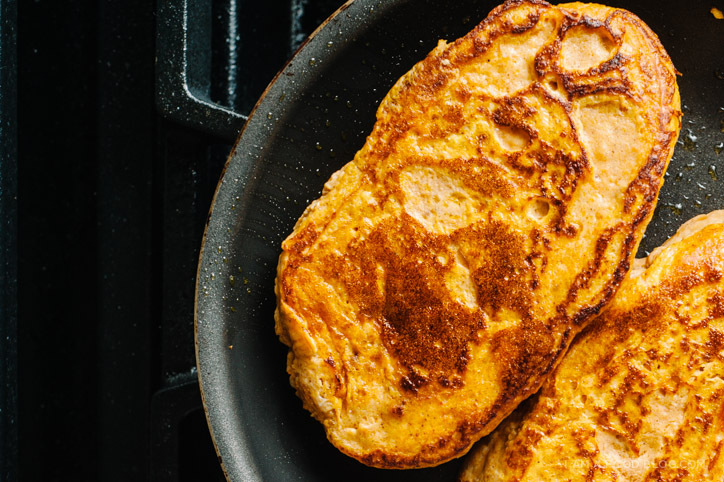 Melt a pat of butter, or use a bit of oil, in a large skillet over medium to medium-high heat. Add the soaked slices of bread and fry until golden brown on both sides, 2-3 minutes, flipping once. Giiiiiiirl, this looks insanely delicious!! LOVE! You’re killing me over here! I’m trying to reduce my sugar intake but all the yummy recipes you have been posting is making me want to take the sugar box out of the vault :) ! I am obsessed with this recipe! 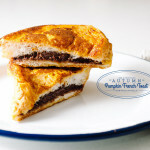 It’s all of my favorite things–pumpkin, Nutella, bread pudding-adjacent… (Yeah, I’m a weirdo who loves bread pudding.) Also, you blew my mind with the pumpkin=fruit thing. I had to wikipedia it, and learned that it’s a *berry. * Are you kidding!? What’s up with that, pumpkin?! Fascinating! This looks INSANE. I have to make this, I mean seriously… Wooooowwwwwwwww. I want to cry I want this so badly. 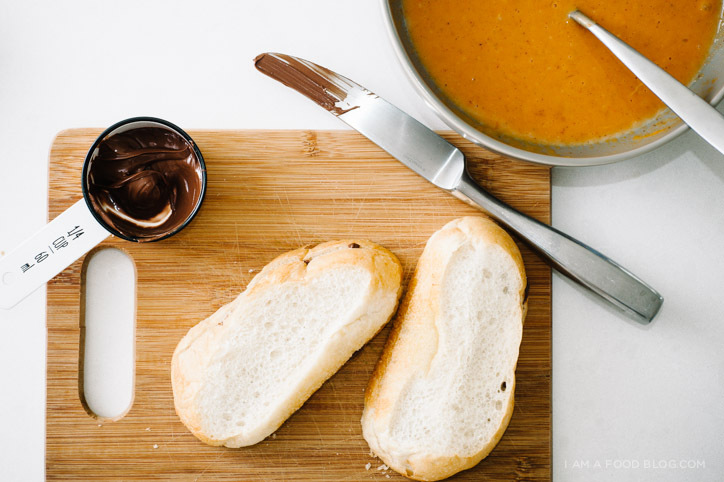 it reminds me to my childhood, when my mum prepared me nutella bread almost every snack afternoon. This recipe is amazing, but it will be hard for the new bakers and chefs out there to know what you mean by just “pumpkin” do you mean pumpkin puree? Also for the bread you say that it needs to be stale but what kind would be best? Thanks and keep up the good work! 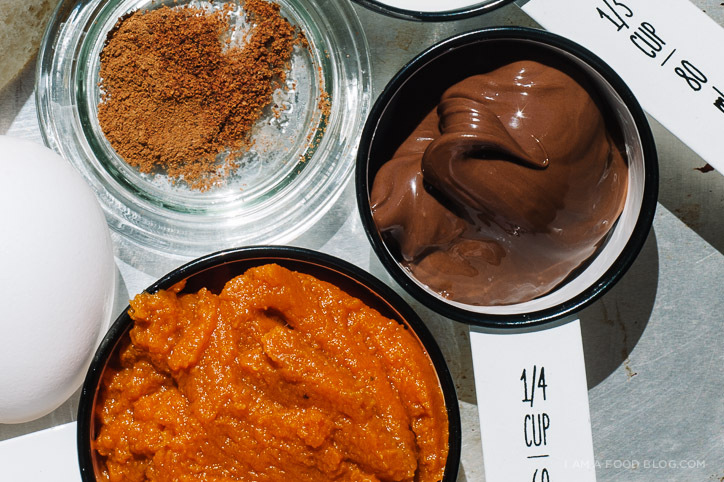 Yes to the pumpkin being pumpkin puree. As for the bread, you can use whatever kind of bread is your favorite. I used some slices of French bread, but really, any bread will do. Hope that helps!